George Frazer was investing decades before most advisors were even born; long ahead of the retail mutual fund boom, before credit cards and socialized health care, before the Maple Leaf was branded on the Canadian flag and before China was Communist. 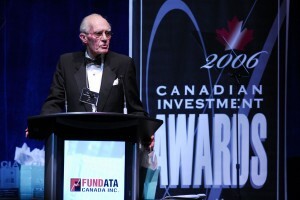 “I really feel humbled by this whole thing,” says Frazer, 80, chairman of Toronto-based investment firm Leon Frazer & Associates Inc. and the recipient of the Canadian Investment Awards 2006 Career Achievement Award. “I’ve never really touted anything I can’t prove, and it’s taken me a long time to prove them,” he says of some of his investing theories. For example, he has always advised investing in dividend-paying companies; to invest while keeping in mind that your firm is a business unto itself; and to aim for the bottom line. He has also advised not to fool yourself into believing in capital gains, because over the long term — and on average — you can only count on stock prices to rise with the cost of living. Frazer’s philosophy has proven true, especially these days, not only as boomers head into retirement with income on their minds but also as the government’s income trust ruling has added an extra sheen to dividend-paying stocks. Sixty years on, Frazer’s investment philosophy is the same today as it ever was. “No, no way,” has it ever changed, he adds emphatically. The original Associate Investors Ltd. fund, started in 1950, was owned and run basically for the family and acquaintances, explains Frazer. Bill Tynkaluk, who still helps manage the fund, joined in 1956. When family members began to buy houses, Frazer says, the only way the firm could keep operating was to feed the fund with some distributions, which it found initially by joining with Guelph, Ont.-based Co-operators General Insurance Co. ’s Canadian Conservative Focused Equity Fund. Co-operators later sold the fund to Clarington Corp. When Industrial Alliance Insurance and Financial Services Inc. acquired Clarington, Frazer’s fund took on the name IA Canadian Conservative Equity Fund. Frazer still co-manages the $278.5-million fund with Tynkaluk and Patrick Magee. Their firm manages about $1.3 billion, including a handful of portfolios for Counsel Wealth Management, the Mississauga, Ont.-based firm ultimately owned by IGM Financial Inc. Since 1981, the first year that Morningstar Canada began tracking IA Canadian Conservative Equity Fund’s data, it has had an annualized return of 10% to Oct. 31, slightly edging out the return of the S&P/TSX composite index over the same period. The fund ranks in the top quartile over 10 and 15 years. Although many fund managers today point to the likes of Sir John Templeton, Warren Buffett or David Dreman, these people are, in fact, Frazer’s peers. And one or two major international fund companies have looked to Frazer’s original fund charter for a model on which to base their own funds, although he doesn’t want them known publicly. Frazer is an original himself, having learned the principles of investing in the early 1950s from his father, Leon, who founded the company in 1939. In fact, Frazer’s career is not one that has taken him far, unless one counts dedication and loyalty in miles. His resumé isn’t adorned with multiple presidencies, chairmanships and managerial positions. The last job offer he ever accepted was in 1947, on a day that he calls the “highlight” of his career. After the Second World War (he never made it overseas), Frazer attended the University of Toronto to study commerce and finance, then took a job with a chartered trust company. Frazer recalls that every Friday afternoon he would meet with his boss, who would ask him investment and market questions. He would go home for the weekend and consult with his father. “And Monday morning I’d go into the office and say, ‘I think I have the answer’,” quips Frazer. That year, Frazer worked for $600 and continued to live at home, where he stayed for five years until he married his wife, Elizabeth, to whom he has been married for 51 years. They have raised three children — Bruce, Anne and Jacqueline. Frazer was born on April 12, 1926. That he should be accepting this award at his age, he admits, is appropriate. He was involved in team sports, but sailing was his first love. The sport took him around the world, racing a 14-foot boat up until the late 1960s.